Not making this up. 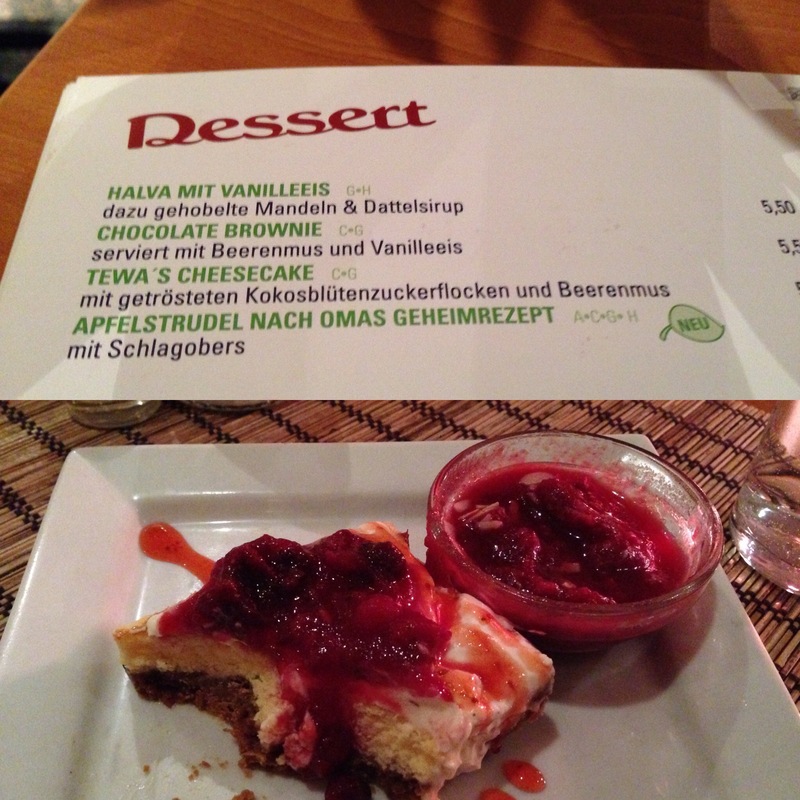 The three words in the headline are an actual bit of explanation for an item entitled “Tewa’s cheesecake” on the menu of the comfy bio-bistro where we had dinner, in Vienna. I may be able to conjugate common verbs and translate oft-used nouns, but when it comes to German-only menus … I am in deep trouble. Kokosblutenzuckerflocken und Beerenmus is a good example of a couple of words I never learned from Herr Klenner. And what does that mouthful of bistro dessert translate to? First, let’s complete the menu entry. After the English-inflected title — Tewa’s cheesecake — we have a couple more words to complete the whole of the descriptive bit. First, we take into account that the 24-letter monstrosity of a word is a fine example of the German-language preference to jam several words into one long, unwieldy compound word, as a neologism. To Vienna tourists with no history of studying the German language, those 24 letters (Kokosblut, et al) look as impervious to analysis as the dark side of the moon. If you took German I and German II, a million years ago, you know that first you begin by deconstructing, as best you can, the 24-letter word into its constituent parts. Which literally translates (I’m pretty sure) as “coconut sap sugar powder”. So, to order it in the most-efficient fashion, in English, it probably should go as: “Powdered-coconut-blossom sugar”. It arrived at the table looking like a square of cheese cake with sticky red stripes across the cake and, off to the side, a small bowl with red fruits (currants and raspberries) in it. It took us longer to figure this out, with the crucial help of our waitress, than it did to eat it. Turns out, “powdered-ccoconut-palm sugar” is a “thing” in restaurants with health-food or bio impulses. It is a sort of sugar apparently better for the human body to ingest. A little bit of sugar, in this case, nearly broke our brains.